Brendan Beaver, Sales Manager of Metrel, looks at why changes to the 18th Edition should have minimal impact on testing, as long as you’re armed with the right equipment. Vehicle charging points can, from the start of this month, be protected by either a RCD type B or a RCD type A and appropriate equipment that ensures disconnection of the supply in case of a DC fault above 6mA. It’s likely that contractors are going to be attracted to fitting car charging points with the latter type protection to avoid the need of using a more costly B type RCD. In the good old days, when life was much simpler, a DC current of around 6mA was used to lock A type RCDs to stop them from tripping during loop testing, so the 6mA DC current protection needs checking. Also in a recent survey, more than 50% of installers questioned said that they’d experienced RCD failure straight out of the box. It’s therefore essential that the whole system is checked on installation, as well as at intervals during the equipment’s lifetime. Type B DC sensitive RCDs are rated at 30mA. They can be tested by a range of premium test equipment using various routines. However these testers are sometimes limited to a DC sensitivity in the region of 15mA and above, nothing as low as 6mA. So how do we test the charge points with 30mA AC and 6mA DC protection (also known type EV RCDs)? Fortunately there is a solution. Metrel has developed the innovative EVSE Adapter A 1532, which plugs directly into charge points, known as electrical vehicle supply equipment (EVSE) to the regulators, giving access without opening the box. One of the immediate advantages is that the adapter accesses the charge point in the same manner as an electrical vehicle and thus tests the system as a whole. It can test the charging point in all charging state outputs: disconnected, charge ready, active charging (with or without ventilation) and pilot error. While it can be used with a range for all-in-one testers, the Metrel MI 1352 offers the 6mA DC test to confirm compliance with the new 18th Edition regulations. The MI 3152 touch screen installation tester offers programmable auto sequences to cost-effectively help the engineer through all the required tests and ensure they never again leave an installation without completing the full set of test results for certification and invoicing. 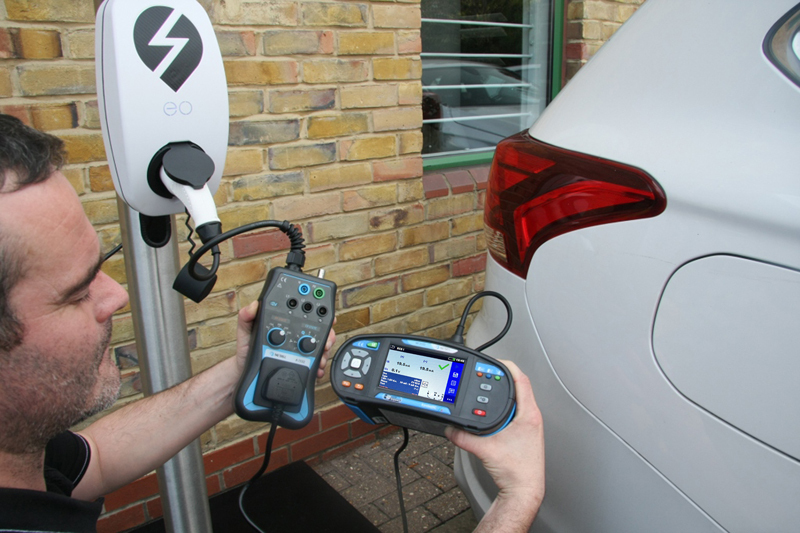 The installation and inspection of the vast number of vehicle charging points required in the UK by the government’s target date of 2030 is the biggest commercial opportunity for the electrical trades in history. Those businesses that can respond adequately on price and service stand to grow and prosper. Having the right test equipment will be a major component of that growth.